Finishing, progressing and partying ! Good morning all from a wet and windy Ireland. There was no post last week as I lost my stitching mojo for a couple of days but it seems to be back and yayyyy that it is. With Lukes wedding in a month and his sampler needing finishing and a shawl thats half done that I need to wear…I need to get moving, add into that the Christmas List and ohhhh my ! First things first though…yesterday was Dominic’s birthday. He’s my second eldest and he turned 10. Scary how quick the years are going. Well I got his picture finished and framed. 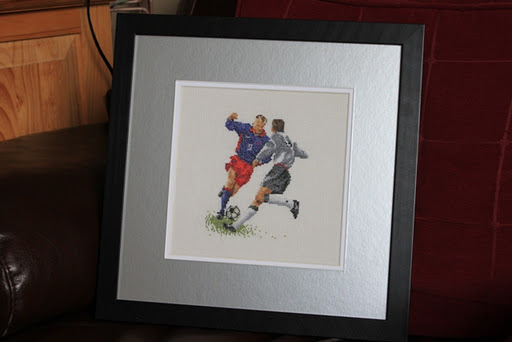 The Footballers all finished and framed. He very kindly sat for me with his picture so I could show you all. 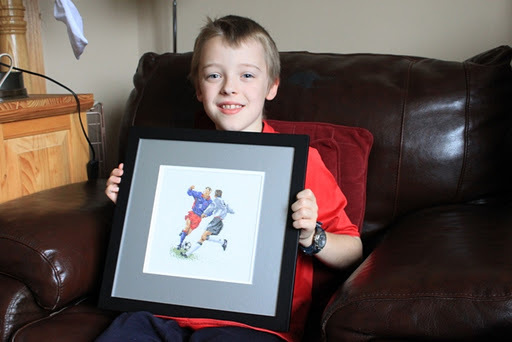 He loved the picture and thought it very cool when he unwrapped it. Dominic showing off his Footballers. I think he had a wonderful day as he crashed out at 9 last night on the couch and on his way to bed he said it was the coolest day ever but boy was he wrecked lol…. As you can see the man is finished down to having his shirt and hand done, these I’ll do as I’m doing the lighter shades on the lady. I haven’t done anything on the pope this week as I’ve been wanting to get the sampler complete. I’ve also been putting together my final list of 15 projects for the crazy challenge I’m doing on facebook. I’m trying to work in some projects that can be used for the birthdays through the year so I’m less under pressure and then I may actually see a finish or two lol.. more on that over the next couple of weeks. 9 Responses to Finishing, progressing and partying ! Good Morning Ruth! 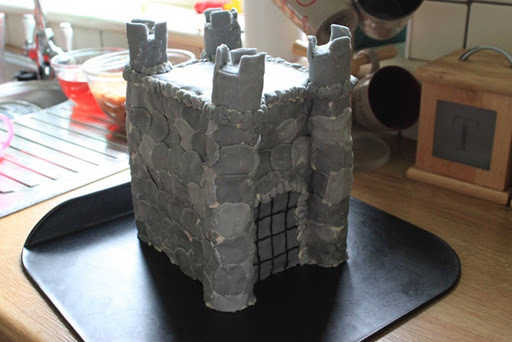 What a wonderful castle cake! I love it almost as much as Dominic. 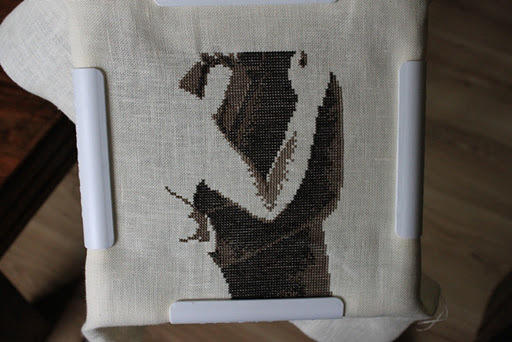 😉 Glad to see so much progress on the wedding sampler. What a busy week for you. Hi Ruth, it's so nice to meet you. :)Happy Belated Birthday do your handsome boy!! 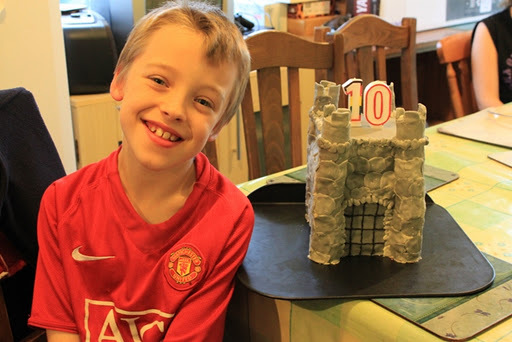 Love the cross stitch you made him and the cake is awesome! !Enjoy IHSW. 🙂 I can't wait to see what you're stitching this weekend. Happy late birthday to Dominic, he is such a handsome little man! I just simply love the cake and I bet it was really yummy too!!! I will be joining you this weekend for the IHSW. Love your stitching progress!! Very cool gift and cake. Happy Belated Birthday to D!